What Is The LEGAL Implication O The Error In Ogah’s Certificate Of Return? My inbox is filled with a thousand and one questions not dissimilar to the caption of this brief article. 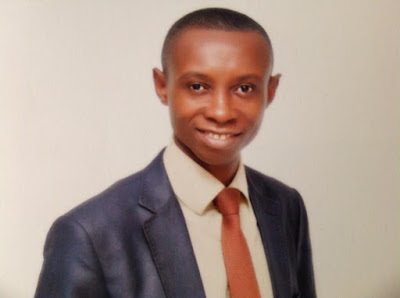 I have been inundated with series of calls that require explanations on the effect of the obvious mistake found in Dr Uche Sampson Ogah’s Certificate of Return issued to him by the Independent National Electoral Commission on the 28th day of June, 2016. 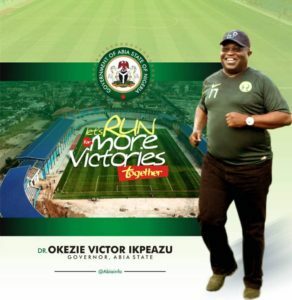 It is no longer news that whereas the Certificate of Return issued to Dr Okezie Victor Ikpeazu bears two dates- 11th & 25th April, 2015, that of Dr Uche Ogah bears only one date- 11th April, 2015. 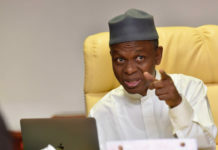 However, it is a fact within the knowledge of Nigerians and the international community that the gubernatorial election conducted by the Independent National Electoral Commission in Abia State on the 11th day of April, 2015 was declared inconclusive. None of the candidates that contested that election was declared the winner of that election. 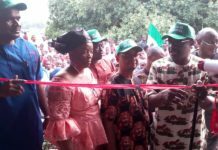 Consequently, the Electoral Body ordered for a supplementary election which took place at selected polling units in few local governments of Abia State on the 25th day of April, 2015. 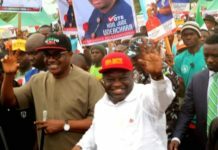 After the said election, Dr Okezie Victor Ikpeazu, upon satisfying the Constitutional requirements with respect to the election, was declared the winner of the election. Thereafter, INEC carefully issued him with a Certificate of Return which covered the two dates. The simple reason is that it is the combination of the two dates that produced a Governor in Abia State. 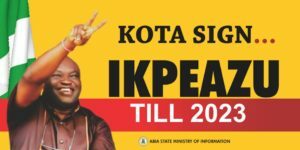 In another development in the State called ABIA, a Federal High Court sitting in Abuja on the 27th day of June, 2016, while delivering its judgment, found that Dr Okezie Victor Ikpeazu- The Governor of Abia State, was not qualified ab initio to contest the 2015 general elections because he supplied false information to INEC as contained in both the documents he submitted and the affidavit he deposed to. The Court ordered that he should vacate from office and that Certificate of Return be issued to Dr Sampson Uche Ogah. Despite filing Notice of Appeal and Motion For Stay and served same on the parties ( though INEC denied service irrespective of the evidence of service ), INEC went ahead to comply to the Order of Court by issuing Certificate of Return to Ogah. Unfortunately to Ogah and INEC but to the glory and honor of God Almighty of Ikpeazu, the Electoral Body, in the course of issuing the Certificate of Return, suffered LOSS OF MEMORY by not recalling that the April 11 election which they conducted did NOT produce a Governor in Abia State. They did not also remember that they conducted a supplementary election on the 25th April, 2015. 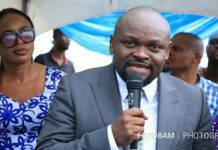 They did not also remember that the Certificate of Return which they rightly issued to Dr Okezie Victor Ikpeazu bears the two dates. What a memory loss! What a grave mistake! Now the question is- what is the legal implication of the obvious mistake? First, it is important to note that the matter between Ogah and Ikpeazu are pending in Court. However, this issue is not before the Court. But I want to assure my friends that something will certainly be done on it. It is highly sensitive to the extent that nobody will overlook it. Meanwhile, one is at liberty to make a brief submission now that the issue is yet to be canvassed either at Osisioma High Court or at the Court of Appeal. It will be taken that INEC has complied with the Order of Justice Okon Abang. What is the nature of that compliance? Was it a perfect compliance? Did they do what the Court ordered perfectly? These reasonable line of questions can be answered by those in the kindergarten,mtrying to be acquainted with the definitions of law. The questions cannot be answered in the affirmative. A document in law speaks for itself. You cannot rely on extraneous matters to explain what is contained in a document that is boldly and elegantly drafted. 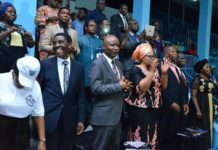 The piece of document which Ogah parades bears April 11 as the date in which he was declared in law as the winner of the election. Unfortunately, the said date did not produce a Governor in Abia State. 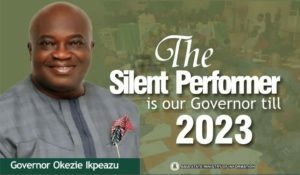 For his own Certificate to cancel that of Ikpeazu, it MUST appear or carry the two dates which jointly produced a Governor in Abia State. In view of the aforementioned analysis which accords to common sense, logic and reason, it simply follows that INEC is yet to comply with the Order of the Federal High Court. By every standard, that piece of document is as good as a LABEL placed AGEGE bread. What even compounded the problems is the fact that the Court of Appeal is now seized of the whole matter. 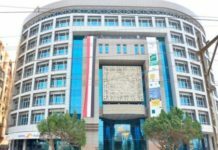 And if for any reason Ogah raises the issue of presumption of regularity since the document was issued by an official body, it simply means that Justice Okon Abang of the Federal High Court owes Dr Okezie Victor Ikpeazu a written apology because Abia State Board of Internal Revenue is not Ikpeazu’s private company. 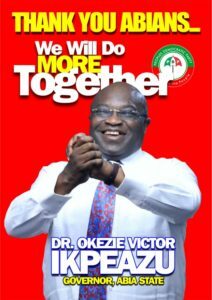 Ride on Governor Okezie Victor Ikpeazu, Ph.D.